Campaigns are now getting to American’s pocketbooks through their cell phones, thanks to digital advertising. While it's not a brand new trend, experts say, this cycle has seen email lists, social media and Google playing a larger role than ever before in how -- and how often -- campaigns ask for votes and donations. Beto O’Rourke, the Democratic congressman from Texas challenging Republican Senator Ted Cruz, is gaining ground with progressives nationwide for his laid-back, candid campaign style. But O’Rourke is going hard after voters online, dropping nearly $7.3 million on digital advertising alone, according to a third-quarter report from the FEC. He focused heavily on digital advertising during the spring, unlike most candidates, but has fallen in line with television trends as well; he spent $9.9 million, or 34 percent of his third-quarter spending, on television, according to FEC data. The online spending for Cruz pales in comparison at a meager $251,000 through June 30, according to Center for the Responsive Politics. At that point, O'Rourke had poured out nearly $4.8 million on digital. O’Rourke’s first ad, for example, was shot on an iPhone and ran exclusively online. Rep. Beto O'Rourke makes a statement during a debate with Sen. Ted Cruz (not shown) at the Southern Methodist University in Dallas, Texas, Sept. 21, 2018. Cruz has instead focused on TV ads attacking his opponent, which is a strategy designed to get potential O’Rourke voters to stay home on Nov. 6, according to Kip Cassino of Borrell Associates, a firm that studies advertising data. Cruz recently was forced to miss a scheduled debate due to Kavanaugh-related votes in Washington. Then, after O'Rourke's team said he was unavailable to set a new date to debate, the Cruz campaign ran a series of negative TV ads. O'Rourke battled against them with a nearly 30-minute-long Facebook Live broadcast. 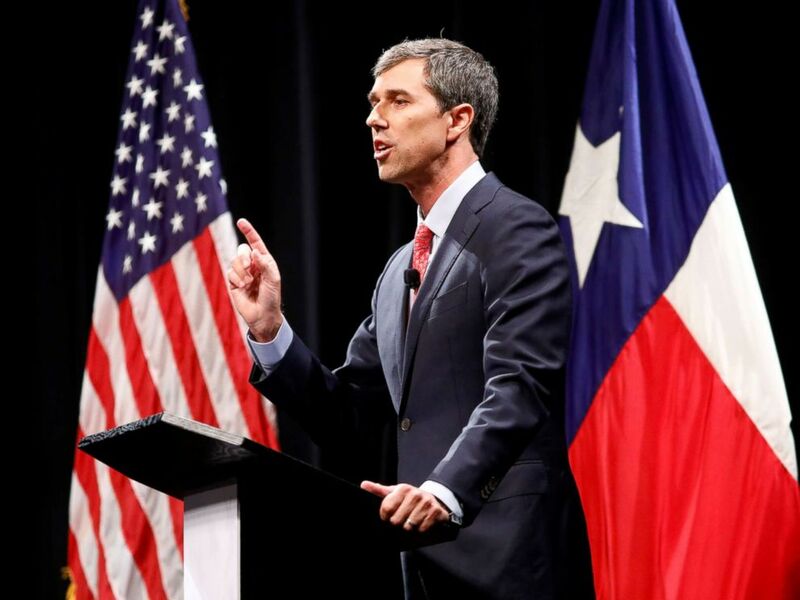 Before the end of the third quarter, the two candidates were neck and neck in spending, but O’Rourke’s campaign announced Friday that it had raised $38.1 million during the third quarter of his campaign, the largest amount raised for a Senate candidate in a single quarter. In that same time span, July through September, Cruz raised $12 million. Though he may have national appeal, and despite all the fund-raising and ad spending, O’Rourke is falling behind in the polls at home. The most recent poll from Quinnipiac University shows Cruz with a steady 9 point lead over O’Rourke. FiveThirtyEight’s Senate forecast gives O’Rourke a two in nine chance of turning the seat blue. Although the difference in spending is shocking, the Texas race isn’t an anomaly. The Wesleyan Media Project is an academic group that studies political advertising and transparency in elections; their estimates show that Democratic candidates are consistently outspending their GOP counterparts when it comes out House races, especially in regards to Facebook and Google. Digital isn't the only place that's seen an uptick-- a recent Wesleyan study shows that nearly $1 billion has been spent on TV, through September 17. That's a 70 percent increase in airings from 2014. Unsurprisingly, Texans have been the target for digital spending this cycle. Michael Franz, the co-director of Wesleyan, said O’Rourke’s strategy is a cheap way for him to amass nationwide support. More than $668 million has been spent on media in the 2018 cycle as of June 30, according to the FEC and Center for Responsive Politics. Of that, nearly $72 million has been sunk into digital ads from federal candidates, the majority for Democrats. Borrell Associates, another firm that tracks advertising data, forecasts digital advertising to dominate heading into the future. In 2014, less than 1 percent of ad budgets were spent on digital. This year, only 3.3 percent of budgets are expected to be spent on digital-- but without the need for mass market buys on TV, ads can circulate at higher frequencies. Borrell forecasts $8.9 billion across the board for advertising in 2018, up 6.3 percent since the 2014 midterms. The digital share of that forecast total is expected to come to about $1.8 billion. President Donald Trump speaks at a rally, Oct. 12, 2018, in Lebanon, Ohio. 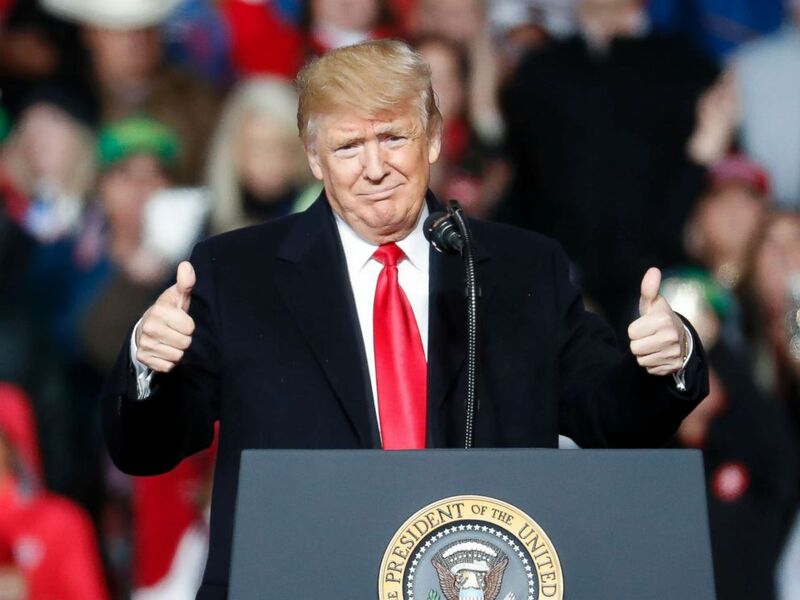 President Trump has embraced the change, spending more than $8.6 million through June 30 in digital advertising since launching his bid for re-election. His campaign is setting a precedent for where advertisers’ focus should be-- in email lists and Facebook feeds-- and others seem to be following suit when looking to build their bases. Facebook's Ad Archive, which they introduced in May, tracks political ads. Users can search any candidate, view statistics, ad performance and detailed information about the advertisement. Trump, for example is running approximately 2,300 ads on Facebook right now. This is further proof that broadcast models are starting to lose hold, experts said. Mass media buys only target audiences in a certain district, and those audiences are likely to see ads for both candidates. Online, that is not so much the case, according to Cassino. Cassino said that online, the number of people who see the ad is not as important as who exactly sees it. This transformation has allowed candidates to test their messages cheaper and more frequently. Trump actively used Facebook to try out highly targeted messages during the 2016 campaign and beyond, according to the New York Times. All of this change raises a new question: privacy. Campaigns can now buy personal information from firms that track online data as a means to target more specific audiences. The amount of digital data someone has out there, the easier it is for campaigns to target them. Social media sites have come under fire since the 2016 election due to a lack of transparency regarding such advertisements. Facebook and Google rolled out an ad verification process that requires groups to register if they want to run political ads. Google then created a database showing who ran ads for races and how much they spent on them. Sites continue to make small strides like these, but regulation has yet to catch up with advertisers’ capability to track voter information online. For reference, broadcast ads are regulated by the FCC and stations must disclose more details about the ad, like the message and what targeted markets they ran in, which allow researchers to track their data. TV ads are typically what Franz calls “persuasion messages,” whereas social media is concentrated on the mobilization of key groups. Joining an email list or donating to a campaign are popular uses of digital strategy -- and help campaigns target voters for persuasion-rooted messages down the road. Previous Wesleyan studies have found what’s been widely known: TV ads skyrocket in frequency as elections loom closer. Digital, by and large, ebbs and flows according to Franz. Cassino and Franz both predict the surge in digital ads to continue heading into 2020. Democratic Sen. Elizabeth Warren is spending big and believed to be using her digital strategy to ramp up for a 2020 presidential bid. According to mid-September data from the FEC and Center for Responsive Politics, Warren had funneled out $2.4 million on digital alone. In the last two weeks, as reported by the Boston Globe and the Center for Responsive Politics, Warren has run over 400 ads on Facebook, reaching an audience of as many as 10 million people. Warren is up for re-election this year, but her race is hardly competitive. Many of her email blasts ask for support for other progressives running tough races across the country. Sens. Bill Nelson and Claire McCaskill, both Democratic incumbents fighting to keep their seats in the Senate, have made their way into the top five spenders as well. Democrats relying on a younger vote are using digital advertising strategy to maneuver those voters to the polls. Digital advertising is being ushered in with what seems to be a new era in American politics. Messages have never been this easy to transmit, and new advertising will undoubtedly adopt a role in mitigating, or increasing, the partisan divide. “What is going to be very interesting is how much the campaigns believe they can get into the social networks, and get into that phone you keep. If they believe at the end of this campaign that they have not reached a level where people are annoyed and disturbed, you’re going to see a lot more of them in 2020,” Cassino said.